On the occasion of the anniversary of His Majesty King Michael I, in the presence of the members of the Royal Family of Romania, Princess Margareta of Romania Foundation invites you to a concert, held by renown artists, Romanian musicians with international recognition. 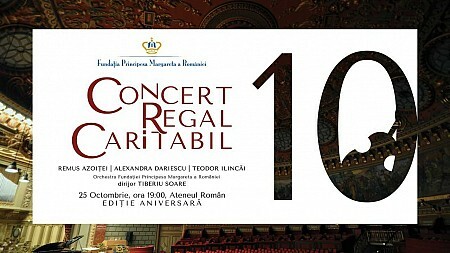 This anniversary edition brings together three of the artists who have conquered the audience in the last 10 years of Royal Concert: Remus Azoitei, Alexandra Dariescu and Teodor Ilincai, accompanied by Princess Margareta of Romania Foundation Orchestra, under the guidance of conductor Tiberiu Soare. Remus Azoitei, the violinist who impressed the audience with a triumphal concert in 2011 at the Romanian Athenaeum, in the presence of His Majesty King Michael I, returns this year as the protagonist of the 10th anniversary edition of the Royal Charity Concert on 25 October 2017. Named by the British magazine The Street as an "incurable virtuoso with a fabulous soul and technique", violinist Remus Azoitei debuted at the age of 8 with the Symphonic Orchestra of his hometown, Galati. Since 2001, Remus Azoitei has been a violin professor at the Royal Academy of Music in London, at that time being the youngest violin professor in the history of the Academy. In 2007, he founded the Enescu Society in London, being one of the founding members as well as the artistic director. Alexandra Dariescu delighted the audience of the Romanian Athenaeum in 2014 with a unique interpretation of the Tchaikovsky repertoire. The young pianist, with a fulminant evolution in recent years, is back this year to celebrate the 10th edition of the Royal Charitable Concert. From the Royal Albert Hall in London to Concertgebouw in Amsterdam to Carnegie Hall in New York, Alexandra Dariescu was recently named as ‘one of 30 pianists under 30 destined for a spectacular career’ in the International Piano Magazine. Alexandra won UK’s Women of the Future Award in the Arts and Culture category in 2013, Romania’s Woman of the Year in 2014 and she has released five CDs to critical acclaim. Tenor Teodor Ilincai offered an exceptional performance at the Royal Charitable Concert in 2015, marking the event with an unique performance. With a vast experience on important world scenes, he is appreciated by critics and public for his particular voice, warm and strong at the same time, as well as his musicality and dedication to the opera repertoire. Among collaborations with important names of the world lyrics we point out the concerts in Valladolid (2011), London and Bodrum (2013), alongside the prestigious soprano Angela Gheorghiu. Conductor of the Princess Margareta of Romania Foundation Orchestra, Tiberiu Soare is one of the most valuable and well-known conductors of the new generation. Graduate of two faculties of Bucharest University of Music, Tiberiu Soare began his career as a conductor in 1999, working with orchestras on international stages, while still making time to dedicate his talent to concerts all across Romania. Established in 2014 by conductor Tiberiu Soare, Princess Margareta Foundation Orchestra debuted the same year, at the Royal Charitable Concert. It soon became one of the most beloved orchestras composed of young musicians from Romania, as well as a spectacular presence of each anniversary edition of the Royal Charitable Concert. You will be able to listen to its performance once again at the 10th Anniversary edition of the Royal Charitable Concert, accompanying an outstanding trio: Remus Azoitei, Alexandra Dariescu and Teodor Ilincai. All funds raised from sponsorships and sold tickets will support the Princess Margareta of Romania Foundation program -Young Talents. This social program offers scholarships, mentoring and promotion opportunities to young artists who lack financial means to develop their talent. Romania loses each year dozens of talented young people, who otherwise might become cultural ambassadors. Many talented children are born in families whose financial possibilities do not allow them to pursue and develop their talent. Even if their talent is discovered by the parents or teachers, even if they are accepted in music or art schools, they still face a lot of difficulties in ensuring the necessary instruments for their studies. In 2007, the Foundation created this national social programme with the aim of supporting and promoting talented young artists from low-income families who need financial assistance to develop their potential and to express their talent. 9 Royal Concerts at the Athenaeum raised funds for the program and its beneficiaries. Over 250 young artists studying in art and music high schools and universities from Romania have been helped to overcome their financial struggles and to continue to express their artistic value.